I'm not a coffee drinker but I can imagine some Scottie Moms might say they need a cup of coffee (or two!) in the morning to keep up with their Scottie kids. After all, we Scottie Moms have a bunch of adventurers and squirrel chasers on our hands, don't we? So when Heather and Mr. K's Scottie Grandpadre gave us this adorable magnet of the Scottie House Blend artwork, I had to share. I figured there were more than a few Scottie Moms who could appreciate the humor and coo over the artwork with the rest of us who love it simply becuase it has a Scottie on it! 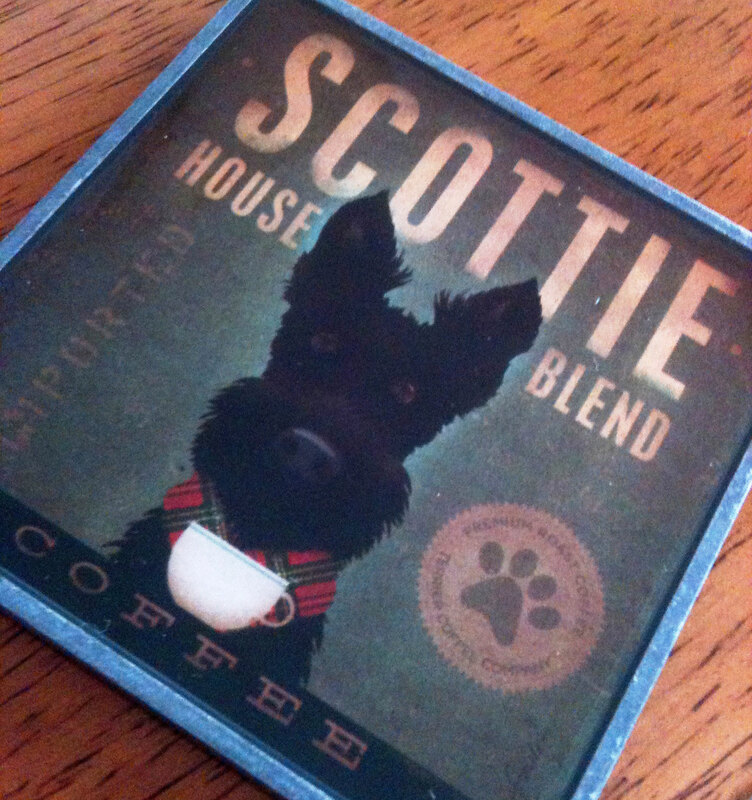 Now, let's think: what would your Scottie House Blend coffee taste like? Because Heather and Mr. K's personalities are so chill, I'd imagine my Scottie House Blend would be a warm cup of decaffeinated coffee, diluted by enough cream and syrups to make the bitter taste go away. (Obviously, because there is nothing bitter about my Scotties!) Occasionally, though, I'd have to switch to one with a bit of caffeine so I could experience that kick, or as a Scottie Mom would know it, that burst of energy and personality that makes our favorite breed so unique. Any friends out their causing their Scottie Moms to need a double shot espresso? Awww I just LOVE it!! I have managed to track down some super cute Scottie scatter cushions, I cannot wait for them to arrive! Unleaded coffee? That's as bad as tasteless dog food. I have this print hanging in my kitchen and a magnet at my office! There is actually a brand called Thomas Coffee that has a Scottie logo.